According to the United States Census Bureau, the city has a total area of 5.89 square miles (15.26 km2), all of it land. The north and south branches of the Ecorse River run through Lincoln Park and join just before leaving the city. Lincoln Park borders the cities of Detroit, Allen Park, Melvindale, Ecorse, Wyandotte and Southgate. Long before Lincoln Park was incorporated as a city, an area adjacent to the Ecorse River was the site of a pivotal meeting during Pontiac's Rebellion. 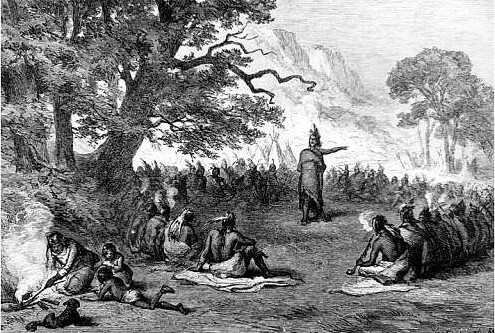 On April 27, 1763, a council of several American Indian tribes from the Detroit region listened to a speech from the Ottawa leader Pontiac. Pontiac urged the listeners to join him in a surprise attack on Fort Detroit, which they attempted on May 9. Today, the area is known as Council Point Park, and a small engraved boulder marks the site of the historic meeting. During the 20th century, Lincoln Park grew as a bedroom community for the numerous workers at Henry Ford's River Rouge Plant and other mills and factories of the auto industry. Lincoln Park gained brief notoriety in 1999 when the high school's principal enacted a new dress code intended to keep out gang symbology and colors. However, included among the prohibited paraphernalia were any items related to the "pagan" or "goth" lifestyle/fashion sense, including most notably, representations of the pentagram. The decision sparked animosity between the administration and the students and teachers, who generally saw it as an excessive measure given gang activity in the school had been largely eliminated in the late 1980s. This animosity culminated in legal action against the school initiated by the ACLU, on behalf of a student who self-identified as a practicing pagan. As of the census of 2010, there were 38,144 people, 14,924 households, and 9,685 families residing in the city. The population density was 6,476.1 inhabitants per square mile (2,500.4 /km2). There were 16,530 housing units at an average density of 2,806.5 per square mile (1,083.6 /km2). The racial makeup of the city was 84.2% White, 5.9% African American, 0.7% Native American, 0.5% Asian, 5.4% from other races, and 3.2% from two or more races. Hispanic or Latino of any race were 14.9% of the population. In the city the population was spread out with 24.3% under the age of 18, 8.5% from 18 to 24, 32.7% from 25 to 44, 20.4% from 45 to 64, and 14.1% who were 65 years of age or older. The median age was 36 years. For every 100 females there were 95.7 males. For every 100 females age 18 and over, there were 93.7 males. The city's education system is served by the Lincoln Park Public Schools primarily serving its 19,700 people under the age of 18. The district includes Lincoln Park High School, Lincoln Park Middle School, Carr Elementary, Foote Elementary, Hoover Elementary, Keppen Elementary, Lafayette Elementary, Paun Elementary, and Raupp Elementary. Mixter Elementary closed after the 2009/10 school year. ^ "Elected Officials". http://www.lincolnpark.govoffice.com/index.asp?SEC=906589A5-9BC0-4E11-8581-3741E0CEE6C7&Type=B_BASIC. Retrieved 2013-02-01. This page uses content from the English language Wikipedia. The original content was at Lincoln Park, Michigan. The list of authors can be seen in the page history. As with this Familypedia wiki, the content of Wikipedia is available under the Creative Commons License.